Improve the delivery of library services by implementing total quality management (TQM), a system of continuous improvement employing participative management and centered on the needs of customers. Although TQM was originally designed for and successfully applied in business and manufacturing settings, this groundbreaking volume introduces strategies for translating TQM principles from the profit-based manufacturing sector to the library setting. Integrating Total Quality Management in a Library Setting shows librarians how to improve library services by implementing strategies such as employee involvement and training, problem-solving teams, statistical methods, long-term goals and thinking, and an overall recognition that the system (not the staff) is responsible for most inefficiencies. 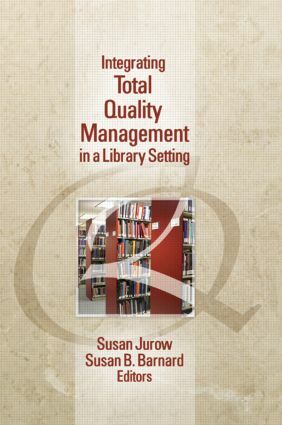 Total Quality Management in a Library Setting describes the principles of TQM, its origins, and the potential benefits and barriers to be expected when adopting quality management approaches in libraries. Chapters provide guidelines for planning and implementation to help libraries use total quality management to break down interdepartmental barriers and work on continuously improving library services. The contributors, who have begun to think about using or who are already using TQM in a library setting, present specific planning and implementation issues that can be put to immediate use in libraries. With this innovative book, library managers will learn that by working together on problem solving teams to address specific operational questions, and by developing a shared knowledge of problem-solving tools and techniques, staff members grow personally and gain a larger sense of organizational purpose. Other TQM methods introduced in this book include the concept of the internal customer, which teaches staff to recognize how other staff members use the results of their work, and the principle of continuous improvement, which enables libraries to set measurable goals based on quantitative performance indicators, and to monitor progress toward those goals.